With a reputation for integrity, fair and competitive estimates, and outstanding customer service, TransPak maintains a dedicated team of trained and safety-conscious rigging and hoisting professionals in the Austin, Texas, area. With in-house forklift capacity up to 36,000 pounds—and with easy access to additional capacity, including cranes—we can move heavy machinery within your shop or that's being trucked across country. We'll send one rigger or a whole team of riggers to your job site for unloading, final placement and alignment. Or number one goal is to protect your equipment and property from damage, personnel from injury and the environment from harm. All of our riggers receive 30-HR OSHA certification. For more about Rigging, visit our Rigging Site. Contact us today to learn more about our fleet of trucks and forklifts and teams of riggers. We're here to move your heavy machinery, safely and reliably in the Austin, Texas area. 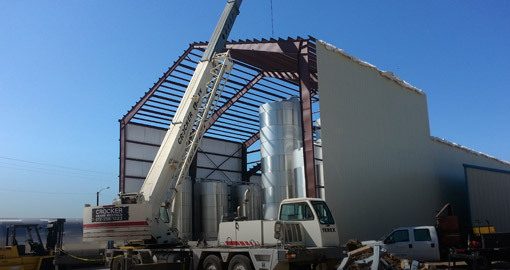 When the first legal distillery in the State of Texas was being built, they relied on TransPak's Austin-based riggers to ensure the 10 ton, 2,500 gallon tanks and processing equipment was in place, on time and ready in order to fire up the still.